Apparently there is some consternation out there about what happened after our hot water tank failed. Not wanting to leave anyone hanging, I'll overcome the cruisers' sloth, and give you an update about that and many other things. We had gone into Paradise Village Marina after the hot water tank failure, and at that point, we had no water system at all. With some help from Home Depot, a taxi driver, a cruiser friend, and a nameless, cavernous, dark, high-dusty-shelved ferreteria (hardware store), Craig was able to effect enough repairs to get the water system operational again, with cold water only. The hot water tank awaits the transplant of a new heater element and new thermostat, both of which are coming in about two weeks, with a visit from Craig's cousin, Gail. The water heater was built by Isotherm, a Swedish company, according to the owner's manual. But the internet disclosed that it was now owned by an Italian company, with parts available from a distributor in Maine. Et cetera. The internet, via the "banda ancha" (cell modem), is a real boon for cruisers! We spent about a week in Paradise Village, enjoying long hot showers ashore, and dodging time share salesmen. There was a fascinating but somewhat alarming small zoo featuring a number of tigers in too-small cages. The attendant assured us that the resort's breeding program was one of the highest rated in the world. We took a jungle cruise up the lagoon with our friends Dot and Mark of Pua'ena. Our guide, Jesús ("call me Chewy"), was able to take us through 1-2 feet of water, beneath low branches, to where the crocodiles lurk. We found a few small ones sunning themselves. They could have been plastic, they were so still. 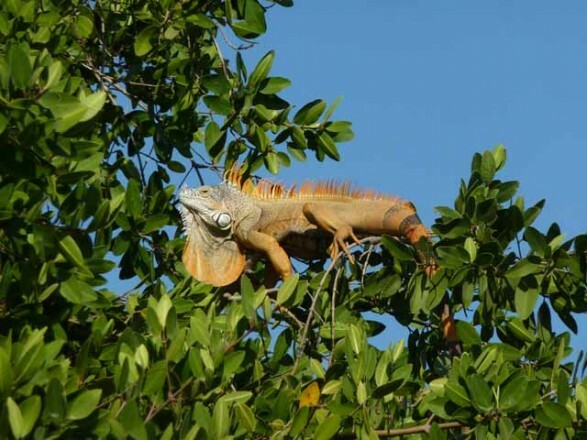 But there was something about the eyes... We passed iguanas high up in the branches of trees. Apparently they've recently been designated a protected species, but there's still a problem with local residents who think they're really tasty. Chewy took us up into a bird sanctuary, where there were thousands of birds, including some we could identify, and some we could not. There were a few blue herons, seemingly the same ones we have in Oregon. Coming back from the lagoon, we cruised through an area of high-end homes (minimum price, three million dollars, Jesús assured us). Once we'd had our fill of hot showers and resupply trips to WalMart and Costco, we decided to head south. The hot water situation was not so difficult. We'll use more propane, heating water on the stove for dishes. We have the sun shower (solar heated hot water) for al fresco showers on the swim step. The trick is to remember to take the shower while the water is still hot from the sun. There's a fine line where the water is still pleasantly warm, and yet it's starting to get dark enough that you won't offend the people on the boat anchored nearby in direct view of the swim step. Wait any longer, and the water's too cold. We're now in Tenacatita Bay. The trip south has been very pleasant. We took off from Punta de Mita, at the north end of Banderas Bay (west of Puerto Vallarta). The first day we made it to Ipala, a very small anchorage, and a bit rolly from the ocean swells that wrap around the corner of the point. The next day, we reached Chamela Bay, where we anchored among ten or fifteen cruising sailboats, off a long, golden sand beach. The town ashore (Pérula) is modest, with a few tourist hotels, but mostly small dwellings and abarrotes (small grocery shops) and other small businesses. There was a llantera (tire store) with a few used tires and rims set out for sale, and an open-air workbench. There was a farmacia, a church, a few modest restaurants, and little else. We ate lunch at a beach palapa, and conversed with a pair of cruisers who left their boat in Raiatea, French Polynesia, and have come back via rental car to commune with their old friends/fellow cruisers who stayed in Mexico. A single-hander came along and told of his plans to finish refurbishing his boat (which he sailed here from the East Coast) and selling it. Like most single-handers, he seemed more than a little bit odd. The next day, we motored about two miles to Isla Pasavera, one of the islands that helps to protect Chamela Bay from ocean swells. It had been our hope to anchor overnight, but the anchorage was too rolly. We did dinghy ashore to the cobblestone beach, and attempted to find a way up the island. But the terrain was extremely steep and covered with cactus or brambly bushes. (And neither of us is as capable of scrambling as we used to be!) The cacti (some variant of Saguaro cactus) seemed to have a bird (usually a booby) perched on every upright arm. These were not the blue-footed boobies of Isla Isabela, but instead their feet are a much more ordinary reddish brown. They fly around, saying "Ow...ow...ow..." and occasionally they end their string of "ow"s with an insane "hahahahaha." Craig says I'm unduly anthropomorphizing these idiot birds. We returned to the north end of Chamela Bay for the night. We made the acquaintance of Kerry and Michelle on Kailani, and invited them over for drinks, snacks and conversation. We found out (to our and their astonishment) that they are good friends with Craig's cousin, Andy, from Kauai, where they all live. What a small world! The next day we set off for Tenacatita Bay, where we are now. We're continuing our efforts to get to know other cruisers, and last night we were invited aboard Southern Cross, out of Portland. Mark and Vicki are from Philomath (near Corvallis), and Mark teaches at Oregon State (Online! Via the Banda Ancha!) What interesting people! The socializing with other cruisers, and the onshore exploration, particularly contact with other cultures, is the essence of cruising. In that sense, we're really just getting into it! People have asked us, what is the difference between cruising in Mexico and cruising in the South Pacific. The nature of the cruising community is one difference. Probably less than half of those in the South Pacific are from the US or Canada. Here, it's probably 90 percent or greater. So the cruising community here is less diverse. Adding to that is that so many of the South Pacific anchorages do not have onshore tourist presence. Accordingly, the cruisers just naturally socialize more with each other. Of course the other differences relate to the environment. In the South Pacific, the water is warmer and clearer, the winds are stronger, and most of the anchorages are more protected.